Discussion in 'Baptist History' started by rlvaughn, May 20, 2018. ORTHODOX BAPTISTS. Name given to a movement of fundamentalist Baptists who emerged in Ardmore, Oklahoma, in 1931. W. Lee Rector (d. 1945), a former professor at Oklahoma Baptist University and pastor at First Missionary Baptist Church in Ardmore, resigned to form the First Orthodox Baptist Church, also in Ardmore. His guiding principles included reaction to perceived modernism in the Southern Baptist Convention, a clear premillennial stance, and the basic Baptist polity and thought of James M. Pendleton. Eventually, Rector founded a school, the Orthodox Bible Institute, in 1944 and published a periodical, the Illuminator, later the Orthodox Baptist (1931–). "Brethren, no page of the Book divine can be delegated to a secondary place. Every page of the sacred writ must be equally authoritative or else no page is authoritative. If the writings of both Old and New Testament authors are not to be received on par with the Words of our Lord then we have no authoritative revelation. As touching our faith, it is ours to believe the Bible, and nothing but the Bible, or else to reject it all. To maximize the words of Christ and minimize the rest of the Bible is a breach of honor which in the end can but destroy the whole structure of our faith. Accordingly, we cannot expunge a single page from the sacred writ without thrusting a poniard into the heart of our God. Without both Old and New Testament we have no authority but with both we have absolute authority. As orthodox Baptists we have but two alternatives; namely, we can stand for the whole Bible, holy and inerrant, and live, or else we can cut it to pieces and die. We shall live and conquer only as Bible Baptists." 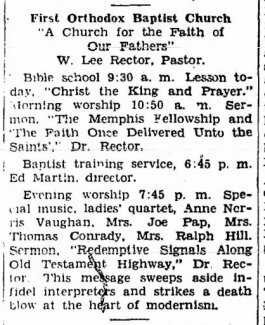 Why was the Orthodox Baptist meeting moved to Little Rock, after it was advertised for Memphis? It must have been a last minute change. Rector apparently never showed up to speak at the GARBC annual meeting in Grand Rapids (although Stealey did), and a promised report on the Memphis meeting never appeared in succeeding issues of the Baptist Bulletin. When did the Baptist Bulletin's report of the May meeting in Memphis come out in print? 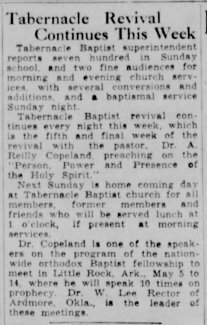 Post #16's clippings are from the GARBC annual meeting preview special issue of the Baptist Bulletin (May 1935 but presumably published some time before the GARBC met at the end of April). It says Copeland would be speaking five times at Memphis, not ten. I had considered possibly two different meetings -- one in Memphis and one in Little Rock -- but the dates are the same, so they couldn't have met in two places at once. Interesting! Might the Convention meeting in Memphis offer the possibility that Rector thought better of meeting there and decided to move it elsewhere? Rector was opposed to the modernism among the Convention Baptists, but I'm not sure he was opposed to the Convention itself. His fellowship seems to have tried to operate to bring about fellowship between a wide variety of Orthodox Baptists. The October-November Fellowship meeting at Ardmore gave a prominent place to Kentuckian John William Porter (who as far as I know was always a loyal Southern Baptist). "His prolific and sharp utterances resulted in difficulties in the membership of the First Missionary Baptist Church, Ardmore, where he was pastor; and he resigned Sept. 27, 1931. The same day he and more than 300 other members of the church withdrew to organize the First Orthodox Baptist Church, Ardmore, Okla., and Rector became pastor." I need to check into this more, but it appears that the pastor and those who followed him were actually in the majority, but preferred to withdraw and start a new church in order to avert a lawsuit (he didn't think their problems should go before the secular courts). "In 1944 this church organized the Orthodox Bible Institute for the instruction of ministers and religious workers in the English Bible. "In 1944 he opened the Orthodox Bible Institute to train ministers..."
Unless I missed something, the year 1944 for the beginning of OBI is in error (Melton & Brackney are probably just following ESB). On March 4, 1942, the church voted to open the Orthodox Baptist Bible Institute in the fall of that year. Brackney's statement about the Illuminator is partially in error as to both the name and date. 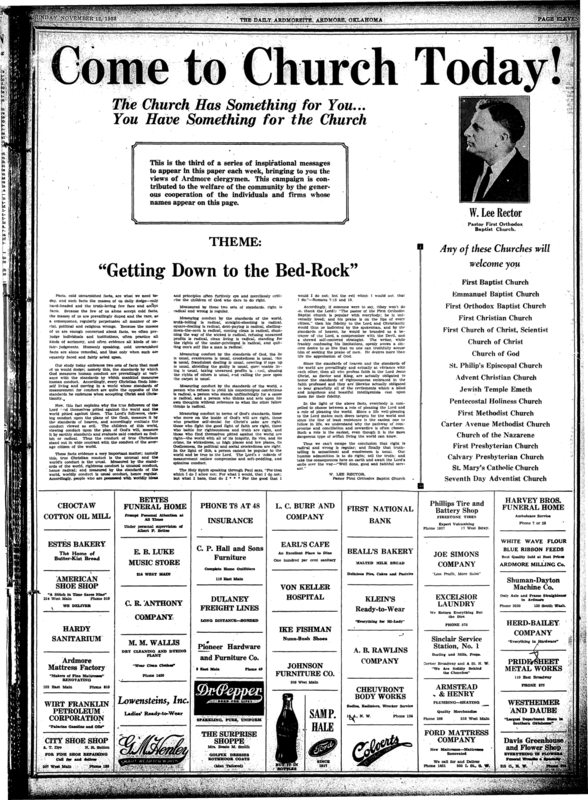 Rector started a paper named Our King's Call October 1, 1930, while still at First Missionary Baptist. 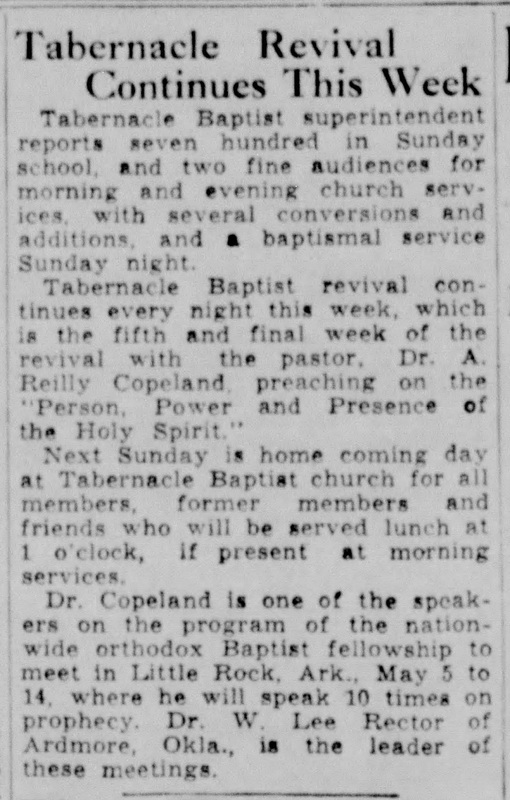 It was apparently his paper rather than the church's; the October 8, 1931 paper was issued still under the same name, but connected with FOBC rather than FMBC. The name was changed to The Orthodox Baptist in 1936, to The Illuminator in 1937, and then back to The Orthodox Baptist in 1942. The last issue in the church library was December 1978, and may indicate the last printing of The Orthodox Baptist. The last few were only two pages, front and back. The issues of The Orthodox Baptist clear up what happened to the Memphis meeting, but leave the northern meeting open to question. There is only a brief mention by Rector of a meeting with pastors up north. My sense is this might have happened before the regular meeting and these guys decided they were not on exactly the same page. (He criticizes the GARBC Confession of Faith later in the October 10th Orthodox Baptist (actually in reference to Norris pushing Stealey "out under truth's gun fire" -- pointing out that the statement left out repentance, and left adequate room to include alien immersion and open communion. 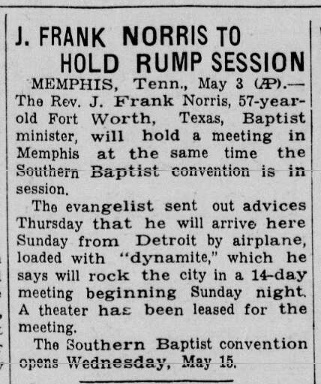 The Memphis meeting, on the other hand, was disrupted by none other than J. Frank Norris. There is a good bit about this in the paper. 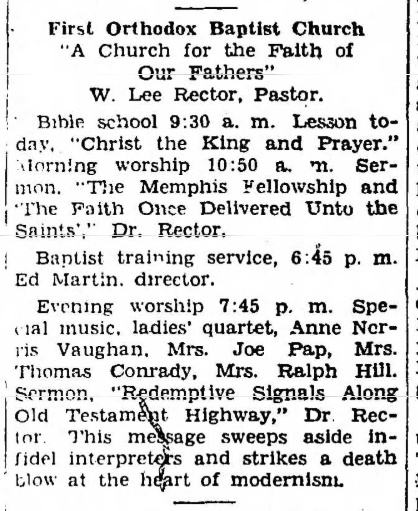 Norris was on the original program to speak/teach at the Orthodox Baptist Fellowship in Memphis. Rector was the one who issued the call for this meeting, planned it for Memphis because of two reasons, and drew up an Orthodox Baptist Statement of Faith to identify who was Orthodox and who was not -- or as Dr. Rector put it, to include the Orthodox and exclude the un-Orthodox! 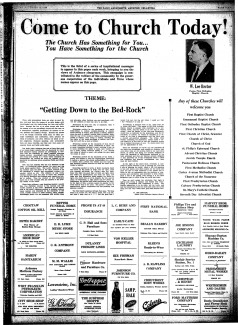 The headline on the front page of the April 25, 1935 Orthodox Baptist is "Dr. Norris Balks At Use Of Our Articles Of Faith." Rector stuck to his guns on the statement. 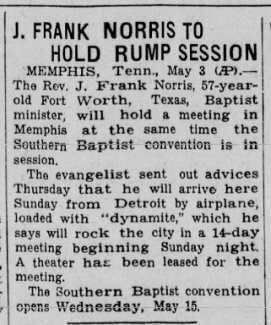 Then, in his typical flair, Norris arranged a meeting in Memphis that began before the Orthodox Fellowship would be over, and continued on to overlap the meeting of Southern Baptist Convention -- so he could compete with both, apparently. Might the Convention meeting in Memphis offer the possibility that Rector thought better of meeting there and decided to move it elsewhere? Jerome, from some things I've seen and especially the things you've posted, I get the impression that Rector's idea of the Orthodox Baptist Fellowship was for it to be inclusive for those who could meet on these terms of historic Baptist doctrine, fundamentalism and premillennialism -- probably without concern of whether or not they were in any other fellowship or association. Rather than my original supposition, I found that one of Rector's reasons for holding the Orthodox Fellowship in Memphis was because the Southern Baptist Convention was meeting there. Unlike Norris, though, rather than compete with it, Rector supposed some Southern Baptist preachers might come early and attend the Orthodox Baptist Fellowship, then attend the SBC. (The other reason he gave was that it was generally centrally-located for most who might be coming.) When Norris pulled out and set up competition, Rector decided to move the location altogether. I want you at Memphis as I told you and I want you to make your arrangements to go. I will arrive home Saturday, May the fourth, and am anxious to see you at once. Rice commented: "As much as I would like to be with Dr. Norris and my B.M.A. or Landmark Baptist brethren, it now seems likely that I will not be able to go. But I pray that much good will be done. I am sure there will be many pleasant and interesting things about the fellowship meeting."